So we know Tarmogoyf will be a card in Modern Masters, but Aether Spellbomb is still somewhat unconfirmed, but appears legitimate. A Return to Ravnica card was once found in an M13 booster (Rootborn Defenses), so finding a Modern Masters card (the set to be released after Dragon's Maze) in a Dragon's Maze booster is entirely possible as Wizards has stated that sometimes after cutting and packaging cards, a card may get stuck and inserted with the next batch printed and cut (which is how cards from the next set can be found in a previous set's booster. Mistakes happen). 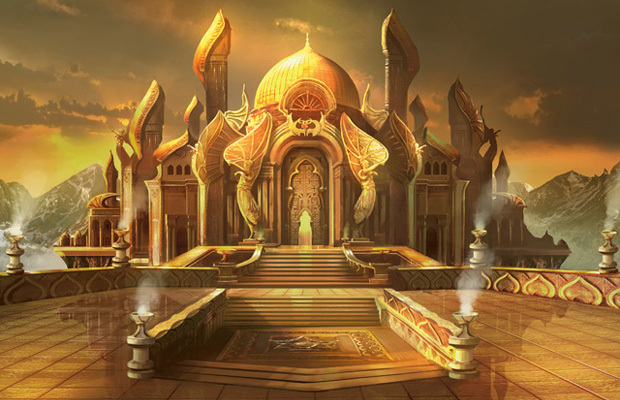 City of Brass is still a possible card, as the promotional art shows what looks like a possible art for City of Brass. So there are possibly three revealed cards, but without the actual card, I won't add it to the spoilers page. Also, watching the video feature that announced Modern Masters, they have mentioned Storm, Faeries, and Dredge, so be on the lookout for some of these things in Modern Masters as it is revealed. Spoiler dates are set as May 27 through May 31 on dailymtg.com, so you can find them there, or here in the spoiler page or in blog posts. So stay tuned. Wizards of the Coast on Twitter (@wizards_mtg) revealed six Slivers from M14, so we know they are back. Not sure it is a cycle or not, but this is interesting. There are two uncommons (white and red) so far, and four commons (one white, two red, and one green), so perhaps we'll get at least two commons each and one uncommon each? Also, they stated that there would be no reprint of Sliver Queen, but that she will be "getting some new friends." Either this means we'll get more slivers (obviously we will like the spoilers above) or perhaps there will be a new five color sliver legendary creature (Sliver Queen, Sliver Legion, and Sliver Overlord already exist). I'm looking forward to more slivers for an EDH/Commander deck I'm building. I'm also completely looking forward to Modern Masters.